The Ekhi and Urko Ocaña brothers, have lived all their life in an artistic and humanistic environment. Fellow countrymen of guitar Maestro Sabicas and with roots from Andalucia, they state that flamenco is a universal music. Their artistic proposal gathers traditional flamenco with their own compositions where they develop their creativity freedom. In the music of this interesting duet, the transverse flute suggests, at times, the voice of a Singer while the flamenco guitar opens up to new sonority effects. Both belong to and write songs for the well-known band “Zorongo”. 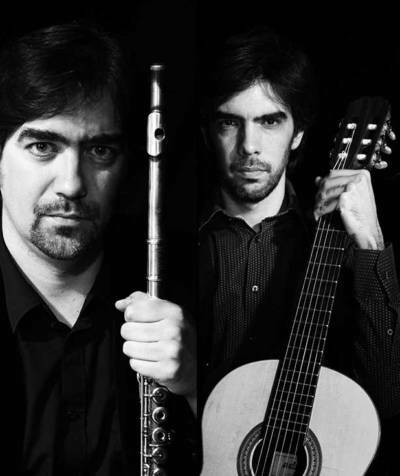 Ekhi Ocaña combines his classis background from his high musical education from the music conservatory studies with the use of the transverse flute applied to flamenco. He also teaches Music History at the University of Navarra, he is a lecturer and director of the University Choir. Driven by his artistic curiosity, he has created and directed multi-disciplinary shows involving music, poetry and dance. Urko Ocaña, eclectic guitar player, has studied with great maestros like Manolo Sanlúcar, J. M. Cañizares and J.A. Rodríguez. He received a scholarship of the Escuela de Música Creativa de Madrid, holds a Degree on Humanities and has a Masters in Cultural and Scene Arts Management. He also plays other instruments like the Arab Oud of the electric guitar.